Sci-fi, dystopia in a new setting with a new concept and quite the thriller. I think Wool will be THE book at the beach this summer. In Wool the people are living in a community below ground. The earth is currently uninhabitable. The people live on levels of the silo, the worker bees getting deeper and deeper into the ground. They are self-sufficient as a community, but communication is limited between levels. Life is strictly controlled and it is dangerous to ask questions. Shift is the prequel to Wool. You find out how the people got where they are in Wool. This book raises as many questions as it answers. Very creative and easy to read. 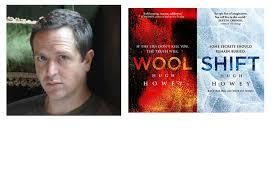 I went along to meet Hugh Howey at Takapuna Library in April, brought to New Zealand for one event in April by his publisher. He is a genuine guy. He seems as amazed at the popularity of his books as I was at his imagination and attention to detail in his imaginary world. He is a champion of making books available online and has plenty of ideas as to how ebooks and paper books can co-exist. His popularity soared as he produced these stories as chapters online and later the publishers then paid attention and made offers. He is also a supporter of ‘fan fiction’ where fans write about characters or settings in the original work, and there are many written around Wool & Shift. I look forward to Dust the sequel to Wool appearing in August. It give me time to imagine what I think might happen.